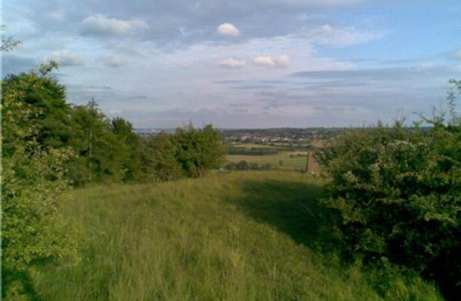 Chalkhills is a privately owned, picturesque nature reserve on the southern Chilterns escarpment that provides stunning views over the countryside towards Reading. The reserve contains some woodland alongside chalk grassland, which is a national priority for nature conservation. The chalk grassland at Chalkhills provides habitat for cowslip alongside a variety of wild orchids including bee orchid and pyramid orchid. Within the woodland a number of species of wild flowers can be found, including the fried egg orchids. These small, fragrant orchids have white petals with a yellow centre. Hellebore and bluebells are common within woodland sites in Whitchurch on Thames. The wild flowers within the chalk grassland are known to attract butterflies such as the uncommon Chalkhill Blue that lives off horseshoe vetch and requires the warms of southern facing downland such as that at Chalkhills. The common blue, green hairstreak and small heath have been recorded at neighboring sites. Among the larger inhabitants at the site are badgers, which have numerous sets within the nature reserve. Hedgelaying is being carried out at the top of the hill in order prolong the life of the hedge and to create a shelter for a variety of wildlife from insects to birds. Scrub clearance is also an important task at Chalkhills in order to remove some of the invasive scrub thereby assisting the wild chalk grassland flora, and the insects that thrive on them, to flourish. The mixed woodland requires management, including removal of some of the non-native species such Norway spruce. To reach Chalkhills from Oxford, leave the ringroad heading south on the A4074 south past Wallingford. Then take the right hand turn on the brow of the hill onto the B471 towards Pangbourne. Stay on the B471 through Woodcote, Cray's Pond (a staggered crossroad), and Whitchurch Hill into Whitchurch on Thames. Turn left onto Hardwick Road (signed Path Hill, with a post box on corner). Chalkhills is about a mile along Hardwick Road on the left. Look out for a green corrugated Dutch Barn roof and enter double wooden gates. On maps Chalkhills is commonly called its former name of Boze Down Vineyard. Chalkhills is rarely opened to the public, so the best way to see it is by coming along to an OCV task at the site.